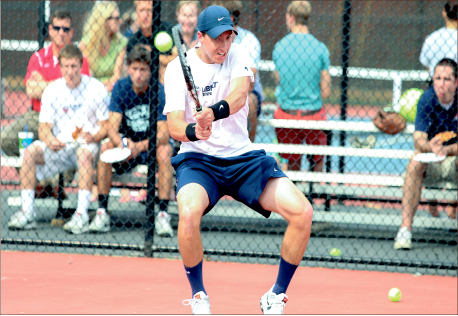 Liberty University senior Shea Thomas’ parents plunked him onto a tennis court for the first time at three years old. With a racket roughly as large as his pint-sized body, it was hard to tell whether he was swinging the racket or the other way around — but he seemed to have a natural talent for the sport. At six, Thomas played his first tournament, coming in third in the under-10 group. From that point forward, he played more and more, eventually landing in Lynchburg years later as a member of the Flames tennis team. Now, graduation is just weeks away, and it is hard for Thomas to fathom the point he has reached in his tennis career. From a solid freshman season that included a five-match win streak in the No. 3 position during spring dual matches to a junior campaign where he compiled a team-record 27 wins in singles and doubles competition, Thomas has always stayed consistent. Now in his final season as a Flame, Thomas is on the brink of tying Siim Tuus for the most singles victories in Liberty Flames history. After posting nine wins in doubles this season, he surpassed Giancarlo Lemmi for the most wins in Liberty doubles history. While Thomas’ on-court skills are crucial, of course, it is the intangibles that he considers his greatest assets. “I think leadership is one of my strengths, being able to lead from the top court, as well as the fight that I give on every play to pump up the guys the entire match,” Thomas said. Now, with the end of his senior season fast approaching, Thomas’ energy and ability are more important than ever. While every season has its ups and downs, Thomas and his teammates are not satisfied with their play so far and hope to finish the season stronger than they began. Once his collegiate career comes to an end, Thomas plans to try playing professionally over the summer. If all goes well, he will stick with it. If not, he will go into his field of business finance. Either way, Thomas is as doggedly optimistic as the three-year-old who was as big as his first racket. Whether or not this season is his last, as the postseason draws near, Thomas is determined to make it his best yet.